The summer childhood enrichment program offers a variety of classes, Dresel said. “What we try to do is try to kind of build the program similar to a college … for children entering first through eighth grade. “… We have classes that are in the creative arts, we have classes in math and information technology,” he said. “We have classes in science, classes in humanities, social sciences. Dresel said several creative arts classes are offered. Dresel said the program runs for seven weeks — all four weeks of June and the last three weeks of July. The first week has already started. Enrollment is still open for the weeks of June 9, June 16, June 23, July 7, July 14 and July 21. Dresel said most of the classes are held away from the main campus. “The individual College for Kids classes are all held in the Family and Community Education Center, which is one mile north of the main campus (at 6500 S Land),” Dresel said. “ … The exception [is] Musical Theater and Cyber Camp (which are held on the main campus). Dresel said one to four classes can be taken each session. “We have a 9 to 10:30 a.m. class, a 10:30 a.m. to noon class, a 1 to 2:30 p.m. class, and a 2:30 to 4 p.m. class. A discount applies for those who enroll in multiple classes, Dresel said. “If you take an individual class, that’s $39 if you’re there all week for that class … . “If you pick a class from each of our time slots, then you’re considered an all-day student[and get] a price break. To enroll, Dresel said, call 405-686-6222 and pay with any major credit card or visit the FACE Center to pay with cash, check or a major credit card. Enrollment must be completed by the Thursday preceding the Monday on which the class starts. 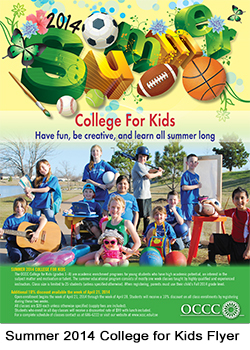 For more information, visit www.occc.edu/coe/college4kids. For a schedule of classes, visit www.occc.edu/coe/pdf/schedule.